This Feel-Good Fall Salad recipe is made with the most delicious collection of vibrant, seasonal, simple ingredients. 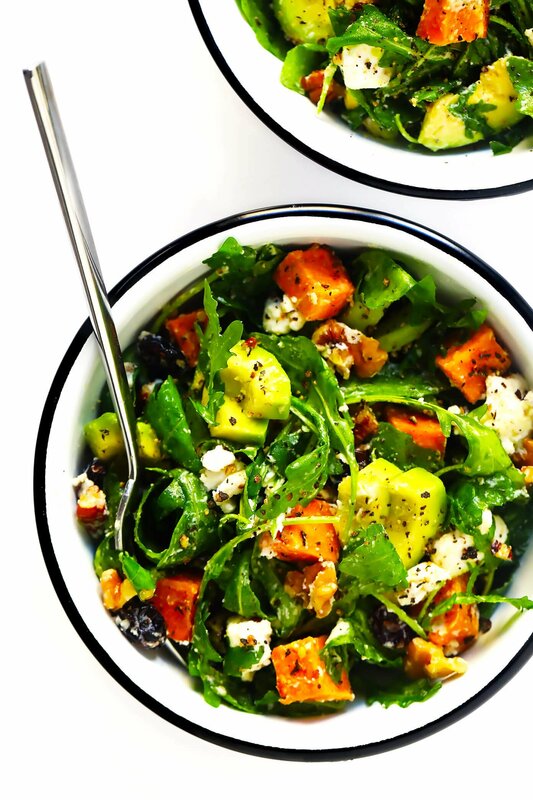 It’s full of quick-roasted sweet potatoes, creamy avocado, seasonal fresh greens, dried cranberries, toasted nuts, tangy goat cheese (or your cheese of choice), all tossed together in my favorite easy lemony everyday salad dressing. And I’m telling you — something about this particular combo of sweet and savory, warm and cool, tangy and creamy, light and hearty seasonal flavors just completely hits the spot this time of year. We absolutely love this one! It is super vibrant and beautiful in person, and feels like a warm, bright, vibrant ray of autumn sunshine on the table. It’s hearty enough to be a feel-good main course if you’d like, or can serve as a show-stealing side salad. It’s quick and easy to prepare, and also customize with any of your favorite nuts, cheeses or greens. It’s full of nutrient-rich ingredients, and also naturally gluten-free and easy to make vegan, if you would like. And oh my word, it is downright delicious. I initially whipped this one up as an impromptu clean-out-the-fridge meal a month or so ago. But Barclay and I both loved it so much that it has been a regular on our autumn dinner rotation ever since. So last week, I finally snapped a few photos and jotted down the recipe, and am excited to finally share it with you today. Let’s make some salad!